I've been lucky enough to have several marketing authors/bloggers send me books lately to review. Unfortunately, I really haven't had time yet to give them the attention they deserve. But I'm going to have to move Andy Sernovitz's 'Word of Mouth Marketing' book to the top of my list. Andy did one thing that I didn't like, he didn't personally mention me as the other books I've received did, I just received a 'form letter' greeting. 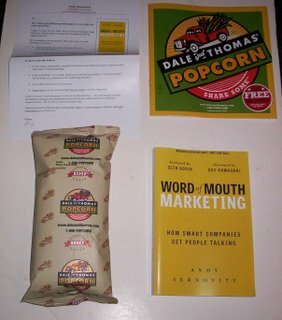 I'm big on personalization, but I'm willing to overlook it in this case, because when I opened the book for Andy's book, I discovered that he had also sent me a free bag of Dale and Thomas popcorn! Great move by Andy as it was completely unexpected, and now he's gotten me talking about him and his book before I even start reading it. 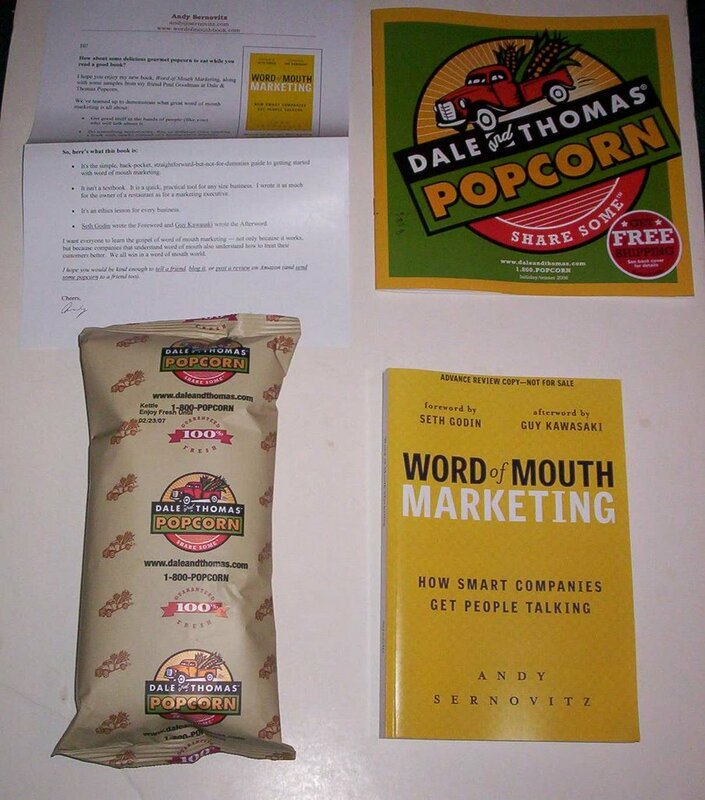 And the Dale and Thomas popcorn was delicious, whereas I'd never heard of the company before this. Yes, I too received Sernovitz's book and was delighted. And I too wish that he had addressed me personally. I can tell you that I checked out the Dale & Thomas popcorn catalog and will likely use that as a holiday gift item this season. Yum! Glad for Andy...and nice pic of the book and goodies, Mackinley :-). P.S. : I was on the review team for Jackie and Ben's book--it's going to be a WINNER. P.P.S. : I also reviewed Paul Gillin's upcoming book (and also publish an essay in it) and it's a homerun, too. Thanks for letting me plug so many great authors! Dude, I didn't get a book! I think I'm going to go in my corner. Of course I'll be there with my copy of Ben and Jackie's book since, like CK, I was on their review team. And your taking a pic of the package shows, again, that interesting promotions are a reward in and of themselves. I just hit Amazon and ordered a bunch of the books I've been meaning to read for a while now. Should be a fun time getting into all these. I promise to address you personally in the future. LOL Mark is bragging to me that his copy was personalized. And autographed. Hey send me your snail mail address and we'll shoot you an early galley copy.